Steve “The Boss” Bossé may have been the headliner on last night’s Montreal Casino card, but rebounding super welterweight Mikael Zewski, eager to vault back to contender status, provided the packed Cabaret Room with the real thrills as he survived a desperately close and bloody slugfest. 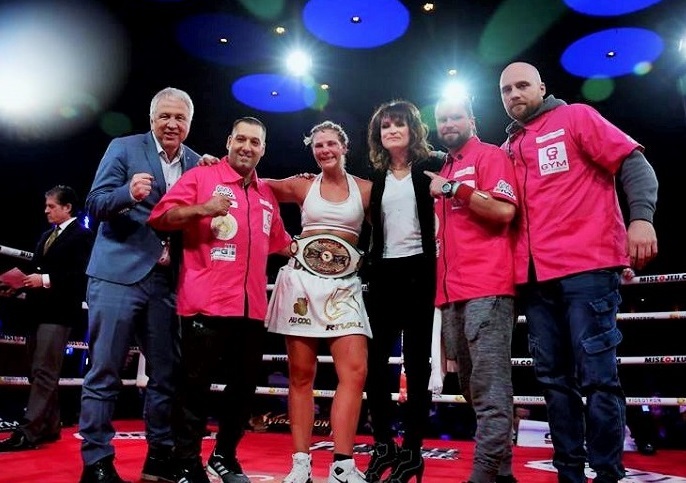 In fact, majority decisions and pints of spilled blood would be the theme of the evening, as Marie-Eve Dicaire also overcame a game opponent and a nasty forehead gash to claim the NABF 154 pound title, continuing her steady march towards a world title shot. 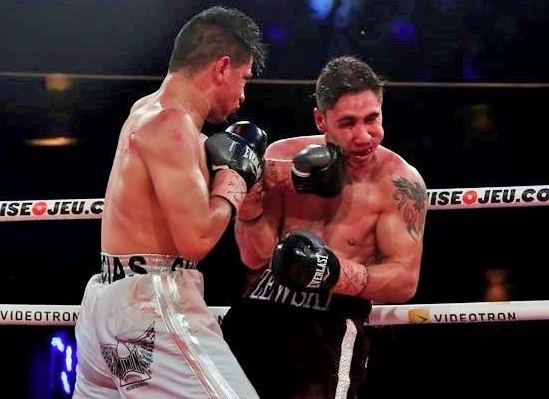 A bloodied Zewski (30-1) dug into reserves of energy he likely didn’t know he possessed to grind out a unanimous decision over ultra-game Mexican Jose de Jesus Macias (23-8) in an old school, blood-and-guts donnybrook. 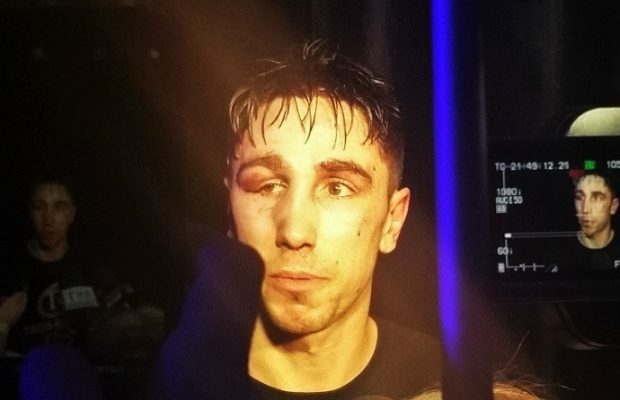 By the end of the match Zewski bore the scars of battle, including a swollen right eye and a nose that continually leaked blood from the opening round. Although the unanimous scores of 77-74 and 78-73 (twice) for Zewski were wider than they should have been, the house fighter definitely showed some brass balls in a performance that was more about guts than grace. Zewski gets win number 30 the hard way. Simply put, the action in Zewski vs Macias was breathtaking in its raw violence, which makes it difficult to catalogue it in a meaningful way. There were multiple standout moments which thrilled the capacity crowd. Although Zewski boxed well in the opening round, Macias drew blood from the Canadian’s nose with a sweeping counter left hook. This blow proved a recurring nightmare for Zewski, who ate a disconcerting number of flush shots. Through three rounds, the Mexican had gotten under Zewski’s skin, both literally and figuratively, and was edging the contest towards a slugfest. In the fourth, the fight exploded in most violent fashion. Zewski, battling off the ropes, appeared to absolutely annihilate Macias with a devastating left hook. Macias fell stiffly backwards and collapsed, his head violently bouncing off the canvas before, in a logic-defying sequence, the Mexican rose and fought back to survive the last 30 seconds of the round. But Macias did more than just survive. In round five he bludgeoned Zewski around the ring, utterly erasing whatever momentum the local fighter had gained from the knockdown. Zewski rebounded in round seven, badly wobbling Macias with a blistering combination to steady his ship. This set the stage for the final frame, which both men wanted, a fact borne out by the savage action witnessed by the fervent crowd. The final three minutes were a back-and-forth slugfest, but every time Zewski seemed on the verge of folding, he found the resolve and strength to unleash combinations. The crowd stood and roared their approval as both men slung leather with abandon and the blood flowed and the sweat splattered. “This will prepare me for the tough fights to come,” declared Zewski after the decision was announced and he had raised his valiant opponent’s hand in a gesture of sincere respect. Indeed it will, but only if the 29-year-old contender can start blocking or slipping counter left hooks. In other action, youngster Mazlum Akdeniz (3-0) kept his unblemished record intact with a dominant unanimous decision over Luis Acuna Rojas (2-2). Akdeniz landed a steady dose of straight left hands from his southpaw stance, and he dug well to the body when the fight moved inside. 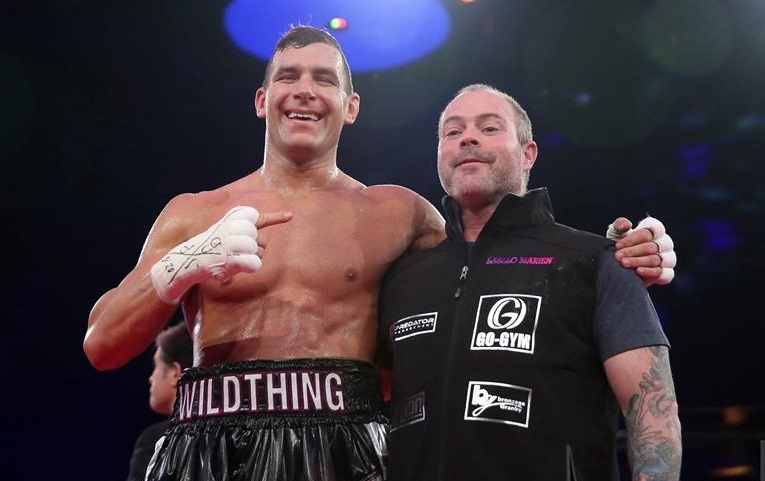 Wild Thing and trainer celebrate a successful pro debut. 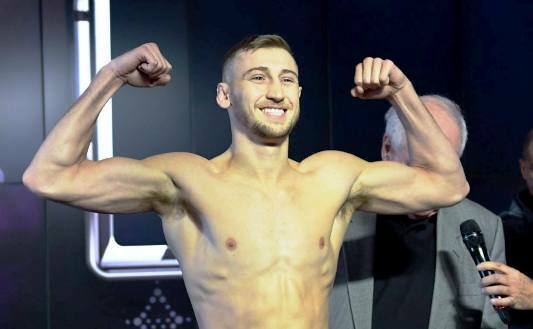 The poise showed by the 20-year-old Akdeniz certainly contrasted with the successful pro debut of Granby native Yan Pellerin (1-0), who eked out a majority decision over Fernando Castillo (2-3). Pellerin, nicknamed “Wild Thing,” has the personality and pizzazz to match his moniker but whether he has the fighting chops remains to be seen. He displayed a sharp jab, but might as have been looking at the stars given how high he holds his chin. Pellerin may think he can grin through the punches he’s eating right now, but defensive responsibility needs to be his priority moving forward. 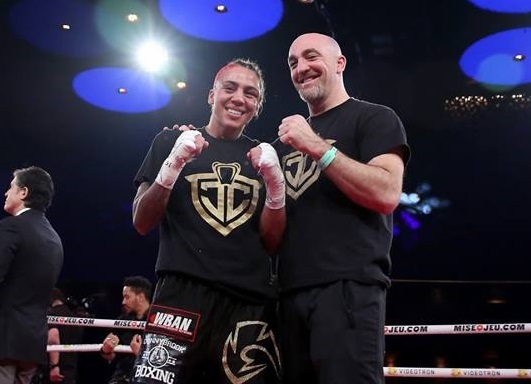 Former Canadian amateur champ Jessica Camara (4-0) gutted out a majority decision over tough Mexican Guadalupe Lincer Ortiz (2-6) in a gruelling four round contest. Ortiz was wide and awkward with her punches, and she led with her head often enough to cause serious swelling around Camara’s left eye. “Cobra” Camara was indeed the superior technician and the more skilled pugilist, but Ortiz kept chugging forward and methodically threw her looping shots, which kept the bout competitive. Chalk this up as a learning experience for Camara. She toughed-out a win over a game and awkward opponent on a night when she was less than razor sharp. Camara and trainer Ian MacKillop. Bruno Bredicean (10-0), returning after a some time off due to injury, impressed with a crushing second round knockout of the experienced Cesar Chavez (32-13). While Chavez had been stopped in all 12 of his defeats coming into this match, every loss was against notable opposition with winning records. In crumpling Chavez so early, Bredicean served further notice that his development as a prospect is in fact right on schedule. The brutal end came early in the second stanza. Bredicean stalked his man, backing him up against the ropes with a thudding body shot. As Chavez leaned back, Bredicean pierced his guard with a harpooning right that crumpled the Mexican. He gamely tried to rise, but his legs appeared weighted with cement, and he sagged back towards a neutral corner when his body refused to cooperate. This was an excellent win for Bredicean, who could make a significant leap in 2018. Marie-Eve Dicaire (11-0) claimed the NABF title at 154 pounds via majority decision over Marisa Gabriela Nunez (7-9-2). The 95-95 and 96-94 (twice) scorecards reflected the bout’s competitiveness, as Nunez refused to allow Dicaire to box comfortably from the outside. The tough Argentine, who is far better than her record indicates, landed solid sweeping hooks and effectively closed the distance and forced Dicaire to scrap on the inside. The hard-fought battle got messy in the trenches and Dicaire had to overcome a nasty gash near her hairline towards the end of the bout that left her face a bloody mask. She showed grit throughout the contest, but she also struggled to impose her technical superiority to land cleanly. The question lingers for Dicaire: Will her lack of power impede her when she inevitably secures a world title shot? Dicaire shows off her new belt. The night’s main event did indeed prove to be the satisfying and violent showcase Steve Bossé’s numerous fans clearly craved. The former hockey enforcer and more-than-respectable MMA fighter scored a punishing second-round stoppage of flabby and fragile Julio Cuellar Cabrera (12-7). Bossé was at times awkward when put on the defensive, and he did instinctively try to hold and hit, as hockey fighters are known to do, but his power and panache are undeniable. Two clean right crosses dropped Cabrera in the first and second rounds, with the second knockdown bringing the contest to an abrupt end. Bossé, keenly aware of the crowd, postured over his prostrate opponent both times, sending his supporters into a frenzy. While it’s hard to say exactly what the 36-year-old Bossé’s end game will be, the man can certainly punch and he knows how to entertain, so he’ll be good for ticket sales. If that, plus the ambition to make some solid domestic scraps, is enough, then his foray into boxing should be fun. At this point, anything beyond that is baseless speculation.